By Rick “Doc” Doggett, CAP 2-7-2, 1970-71The day that Mike Kubina got hit is another of those days that are pretty clear in my mind because of its impact on me and others. It was June 1, payday, and like most paydays, we were sitting around our day haven site figuring how much money we needed in cash to pay off our poker debts and for any trips we might get to the Freedom Hill PX before next payday. As was our custom in CAP 2-7-2 we picked a day-haven at random and waited for the radio call to tell us that the LT was on his way to our “poz” (position). 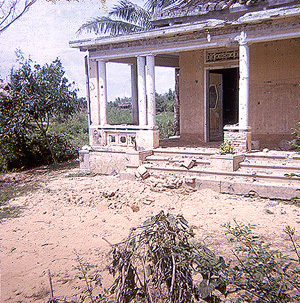 This photo shows the front of the house where CAP 2-7-4 lost three killed and six wounded to booby traps on June 1, 1970. The first and largest booby trap created the crater at the foot of the steps. As was their custom, CAP 2-7-4 set up at the same house they went to every payday, an old French-style house right on Highway 1. The house was set back from the road maybe 25 – 30 meters and there were two or three footpaths down from the road to the front “yard.” John C. “Doc” Brown was their corpsman, and one of the luckiest men alive. He had been the corpsman for CAP 2-7-1 when they were overrun (May 9) and survived without any wounds. I got the details on what happened to CAP 4 from him after we finished the Medevacs.Despite some words of advice, CAP 4 always went to the same place on payday and I guess Charlie could figure out payday was the first day of each month. The LT’s jeep pulled up in front of their site and he got out and started down the footpath to the yard in front of the house when there was a huge explosion. He was also lucky because he wasn’t injured, despite the fact that the majority of CAP 4 was down. “Doc” Brown was also uninjured. We heard the explosion and the radio call from the LT’s driver for a react. We figured that this first explosion had been command-detonated because it coincided with the LT’s arrival. We grabbed our weapons and my medical gear and ran up the trails to the highway and to their “poz.” As we got there, another explosion filled the air but none of us were hit, having not actually entered the yard yet. I dropped my 16 and ran down into the yard with my med bags and found “Doc” Brown amidst the smoke and dust. We started carrying the wounded up to the road where they would be safer and where the Dustoff would be able to land. The LT’s driver was already requesting Medevacs. “Doc” Brown and I finished applying dressings to the guys we had carried up while Mike Kubina and our interpreter went down the path to the yard. I went back down a moment or two later to look for more casualties and had just reached the edge of the yard when I was knocked about six feet by a third explosion. I jumped up and ran back into the yard, finding Mike wounded, some more CAP 4 Marines down and the interpreter dead. Mike had several shrapnel wounds, the worst of which was a sucking chest wound which I quickly bandaged. Someone helped me carry him up to the road, I don’t remember who, but I keep thinking it might have been “Erp” (Denny Erpelding). All of this time the LT was freaking out yelling “Get in there! Get in there.” I’m not sure what he wanted us to do, and since “Doc” Brown and I had been “in there” the whole time, we just ignored him (we did that a lot with that LT, he was an idiot). Before I loaded him onto the Medevac, Mike told me that they had found a tripwire and the interpreter kicked at it for some reason. The curious thing was, the interpreter didn’t have a mark on him, he had been killed from the concussion alone, which indicated a very large explosive charge had been used. We put the rest of the wounded and dead on the Dustoff Hueys and they flew off. I wasn’t until all of them were gone that I realized I had been hit during the second or third explosions. I had a 2-inch piece of meat missing from my right knee but no serious damage. I figured that I had probably been hit by a rock thrown by the explosion that got Mike, since the wound was more of an avulsion than a slice like shrapnel usually leaves. I bandaged it up and the wound healed over the next week or so but left a figure-eight scar on the outside of my knee as a souvenier. The remnants of CAP 4 went into CACO that night and were reconstitued the next day and sent back to the bush. CAP 4 — like CAP 1 — had paid a big price for being predictable — something we tried to avoid in CAP 2. We got one letter, as I recall, from Mike saying that he had recovered pretty well and thanking me for taking care of the chest wound.